In 51 career games for UCLA, CB Fabian Moreau recorded 148 tackles with 26 passes defensed and three interceptions. His career, and his excellent pro day numbers, led many scouts to think of Moreau as a first-round talent before he injured a pectoral muscle. 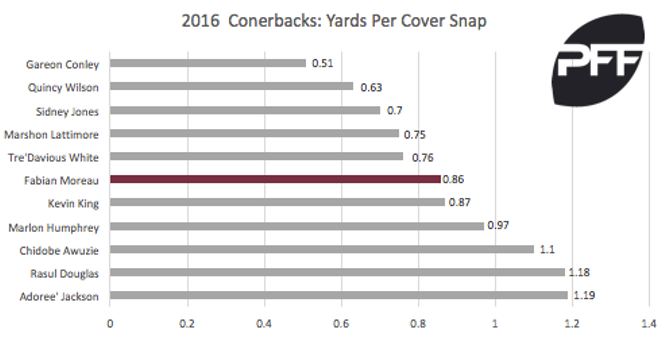 Moreau allowed 0.86 yards per cover snap last season ranking him tied second among all draft-eligible Pac-12 cornerbacks. He also allowed a reception for every 13.6 cover snaps which ranked fourth among those Pac-12 cornerbacks. Moreau allowed a passer rating of 67.2 when the ball was thrown into his primary coverage, ranking him fifth among draft eligible Pac-12 CBs. If he returns in time for camp, he should be able to put immediate pressure on incumbent Redskins CB Kendall Fuller, whom Moreau outperformed at the collegiate level. Fuller allowed the fifth highest completion percentage (78.6 percent) of all NFL cornerbacks last season and allowed a league eighth highest QB rating (120.9) when the ball was thrown into his primary coverage.